Critics have dubbed the vote a charade after several credible candidates withdrew from contest. CAIRO — Egyptians voted on Monday in a presidential election, with the outcome — a second, four-year term for President Abdel-Fattah el-Sissi — a foregone conclusion and a sign that critics say shows the country is sliding back to the authoritarian rule that had prevailed since the 1950s. While many Egyptians see the U.S.-allied former general as vital to stability in a country where unrest since 2011 has hurt the economy, critics have dubbed the vote a charade after several credible candidates withdrew apparently under pressure. El-Sissi, 63, who led the military's overthrow of Egypt's first democratically elected President Mohammed Morsi in 2013, is seeking a second term after a first four-year mandate he says has brought stability and security. But a lower-than-expected turnout could suggest el-Sissi lacks a mandate to take more of the tough steps needed to revive the economy, which struggled after the 2011 revolution drove away tourists and foreign investors. Authorities hope enough people — there are nearly 60 million eligible voters — will vote in the three-day balloting, which ends Wednesday, to give the election legitimacy. Powerful pro-government media have in past weeks relentlessly portrayed voting as a national duty, required to protect the country against foreign conspiracies. The incumbent's sole challenger is Moussa Mostafa Moussa, a longtime el-Sissi supporter widely dismissed as a dummy candidate: Moussa's Ghad party had actually endorsed el-Sissi for a second term before he emerged as a last-minute challenger. "The importance of presidential elections this time is not fierce competition or a real (electoral) battle, but a message to the world that Egypt is on its way through a recovery phase," it said. Critics say El-Sissi's popularity since his 2014 election has been hurt by austerity reforms and a muzzling of opponents, activists and independent media. Courts have passed death sentences on hundreds of Muslim Brotherhood supporters since 2013. El-Sissi's backers — which include Western powers and most Gulf Arab dynasties — say the measures are needed to keep the country stable as it recovers from political chaos and tackles an Islamist insurgency focused in the Sinai Peninsula. Neither candidate has done much campaigning, appealing instead for a high turnout. El-Sissi won nearly 97 percent of the vote in 2014, but less than half of eligible Egyptians voted even though the election was extended to three days. In remarks earlier this month that suggest el-Sissi may see the vote as a referendum on his performance, he said: "If (all Egyptians) vote and a third say, 'No', that would be a lot better than if half that number turn out and all of them say, 'Yes.'" "We urge you not to treat this election as a legitimate expression of the Egyptian people's will"
El-Sissi's top opponent, former military chief of staff Sami Anan, was arrested and halted his presidential bid after the army accused him of running for office without permission. Even before campaigning officially begun, the United Nations, rights groups and opposition figures criticized the run-up as compromised by arrests, intimidation of opponents and a nomination process stacked in favor of the incumbent. 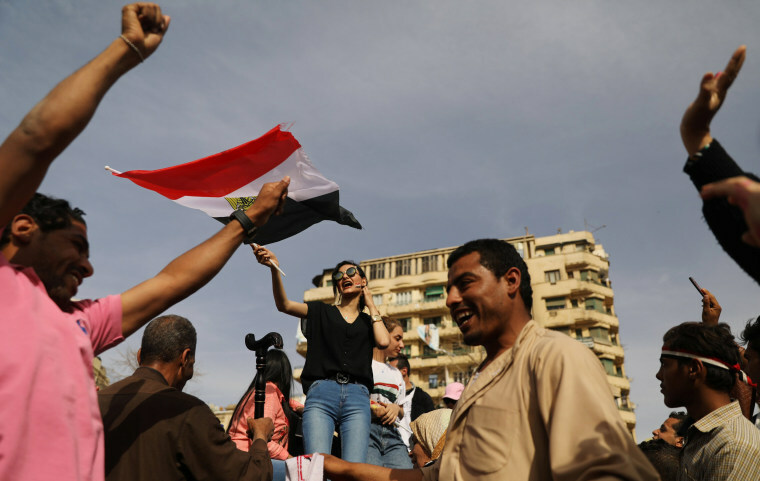 In a letter to the Donald Trump administration's foreign policy team, the Working Group on Egypt, a bipartisan group of U.S. foreign policy specialists, said the "sham election" would take place against a backdrop of massive human rights abuses. "We urge you not to treat this election as a legitimate expression of the Egyptian people's will and to withhold praise or congratulations," it said. It said el-Sissi was expected to have his supporters in parliament propose amendments to the constitution to remove presidential term limits. El-Sissi has said he will not seek a third term in office.